You can actually do the bonus objectives for an area without being on the daily quest for them. I just completed one in the Fel Forge and Ironhold Harbor. Doing the Iron Front area didn't seem to count towards progression of this quest, though I did receive apexis on completion (it also immediately reset). Ruins of Kra'nar and Temple of Sha'tar did count. This quest doesn't become available until after you do the table mission for Draka. Effectively, you need to do three objectives every day - the one to unlock this quest, then two more for this quest. This quest must be completed in a single daily lockout period. Progress will not be counted the following day, so you can't pick it up, do one objective, then come back tomorrow when you have a new quest for another objective. You must complete the objectives the same day you pick up this quest. Be aware that if you're doing these late at night (or, say, you are Pacific time and the server is Eastern), the daily reset can happen while you're busy and things get wonky. Effectively (unless I'm missing something), the standard daily objective cycle is: Do the mission table, pick up this quest, do the objective he gives you, then pick one self-guided objective to do yourself. I hope this helps. Honestly, I think it would have been far more clear if this quest was available right at the beginning and just said '3 objectives'. The way it's set up now it kind of feels bad that you do an objective, then get the quest and have to do more objectives - and the one you just did doesn't count. Purely psychological, I know. I had the bug where it didn't give me credit, so i killed a few more and clicked an objective and it gave me credit. 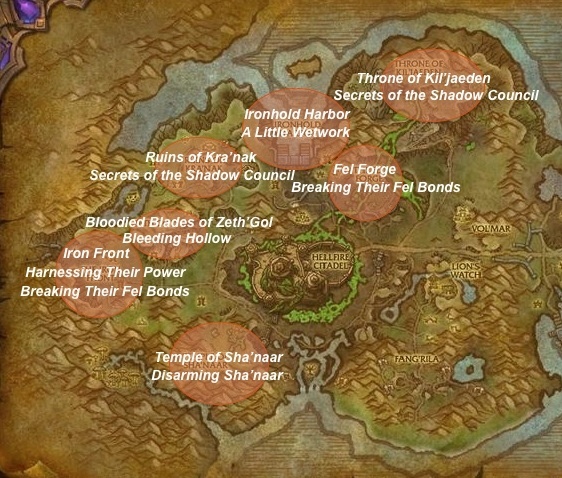 The Iron Front and Zeth'gol are by far the easiest bonus areas to do (of the 7 total areas you can choose from). It only takes a couple minutes to complete. Throne of Kil'jaeden is by far the hardest and longest. The mobs have more health and there's less of them. If you want to complete this quest quickly do Iron Front and Zeth'gol. What qualifies as a "bonus objective" please? Thanks! Complete 2 objetivos bônus de área na Selva de Tanaan. Botamos os lacaios de Gul'dan pra correr, comandante! Se estiver a fim, podemos botar pressão em outras fortalezas dele também. Representou, comandante! Mais dia, menos dia, vamos conquista a selva inteira.